Death has rarely been the very end of the story for any character on SUPERNATURAL. However, what does end up being the surprise is how the deceased comes back—and with a genre show, the possibilities are pretty limitless. 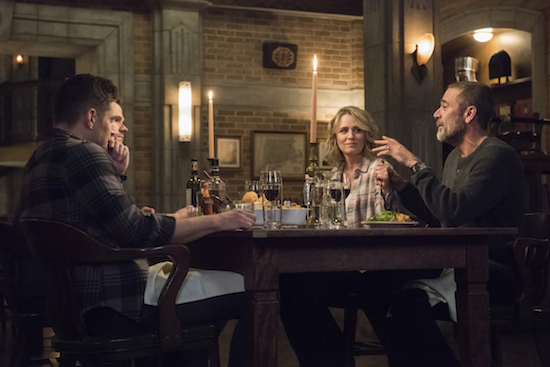 When it came to reviving the long-dead John (Jeffrey Dean Morgan) in the drama’s milestone 300th episode, “Lebanon,” the man who appeared was 2003-era Papa Winchester, thanks to a mix of a wish and time travel. Though the reunion was short-lived, as the family had to reverse it to prevent ripples from the time shift impacting everything—including erasing Mary (Samantha Smith) from the present timeline—their time together made its mark…on the present and past.